Stainless Steel Bracelet chain (.2 or 5 mm wide). Premium Medical Mini Dog Tag with engraved medical Emblem. 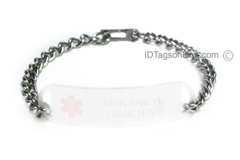 This Bracelet chain, IDRBST33 (size .2" or 5 mm wide) is made from premium grade Stainless Steel and is guaranteed to be rust free for the life.